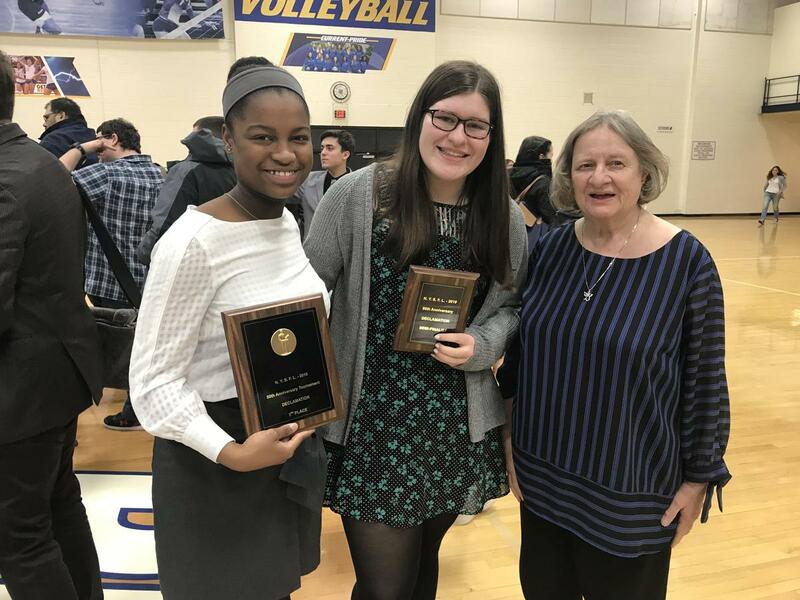 Seven Sacred Heart Academy students of the Speech and Debate team -- Sophia Camulaire, Olivia Christel, Kaitlin Cox, Tara Gilles, Lindsay Moran, Carmela Musso and Carolyn Wiedenhoft -- competed at the New York State Forensic League Competition for Speech and Debate in various categories. The competition took place at Hofstra University on April 6 and 7. Sophomores Lindsay Moran and Tara Gilles made the top 12 of the semi-finals for Declamation. Tara continued to the top six of the final round and came in 3rd Place out of about 100 New York State competitors in the Declamation category. In a previous competition held at Roslyn High School, five students -- Gabrielle Bautista, Sophia Camilaire, Lindsay Moran, Tara Gilles and Carmela Musso -- qualified for the National Forensic League Competition in Milwaukee on Memorial Day Weekend.